Businesses and banks won’t simply allow another person to do business in your name. But you can authorize this with a financial power of attorney. For example, you can authorize an agent to sell a car you own and deposit the money into your bank account. When you appoint someone to carry out just one task or a limited number of tasks, this is called a limited or specific power of attorney. This can be the best option if you know you will not be able to attend to business, for example, for two weeks because you are scheduled to undergo surgery. Alternatively, you can enact a general power of attorney, which will authorize your agent to take nearly any lawful action regarding your finances and assets. This can include selling, leasing, buying, or managing your real estate, stock and bond transactions, preparing and filing taxes, collecting benefits, and more. 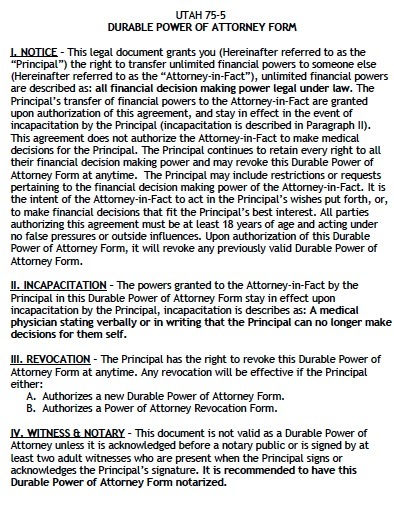 The general power of attorney is a powerful legal device. You should not extend this type of authority to an agent you do not have the utmost trust in. In Utah, you must have one witness sign the form for it to be legally binding.